The following poem was created by Cookie who lives in Cagayan de Oro City in the Philippines. Where she lives is a very special place for me. 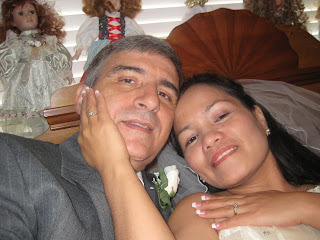 My wife Virginia of 3 years now is also from Cagayan de Oro City, and I have some very fond memories there. The following poem that Cookie wrote shows the obvious very special connection to her father. It is a very sweet poem, and it shows her most inner feeling for her father. I commend her for speaking outright from her heart, and sharing her personal feelings about her father in the form of this poem. Cookie, I have taken the liberty in publishing your poem on this blog. The idea for this blog came from reading the poem below from your blog 'My Personal Touch' about your 'hero', your father. This blog 'Poems from the Heart' exists because of YOU! Just 3 years ago, I married the most wonderful, fabulous, beautiful woman who has filled my life with so much joy and happiness. Her name is Virginia. First, I would like to share the story that was previously published on another one of my blogs called Blogheaven.us. The story is personal to me, but I guess that nothing is really and truly personal if it is published on the internet. To me, I just felt that I wanted to share the story with you. Immediately after the story below, you will also find a poem that I wrote to my wife during our courtship, and it is through the inspiration and deep love I have for her, and by other personal poems from other bloggers that I now begin this blog, that will highlight special poems with that personal touch from people who publish them on blogs from around the world. Anyone who reads this blog can also have their poem published here, and the only criteria would be that the article contains a personal poem from the heart, preferably about someone you love, or someone who is very special to you. No other types of articles will appear here. If you would like it published here, just drop me a note in SHOUTMIX and I will definitely visit your website and consider the poem. If it is not published anywhere, you can drop me a note at poemsfromtheheart.us@gmail.com and I will contact you. There have been 3 women I committed to in my lifetime, but like a famous proverb reads, 'the third time is the charm'. My wife Virginia is definitely the most special person in my life now and will be forever. This episode in my life began during one of my most trying times. After 9 years of marriage with number 2, I was on my own again, knowing that I needed to find a way to find that perfect love. I had failed twice so far, and I even was able to accept the fact that I would now never marry again. As the time went on, I realized one of my greatest fears, and that was 'being alone'. After being hurt so many times in the past, and loosing almost everything two times in my life, was I willing to start all over again, after all, I now have 2 children that are grown and on their own, an ailing mother to take care of, my wonderful puppy Samantha to feed and care for and do I really have the time and the know-how to meet the woman who could be the perfect woman for me?!! The answer was found in the Spring of 2006. To preface the actual meeting of my most loving wife Virginia, I must admit that a few of my closest friends were trying to help me get through this time of pain and humiliation, and I received allot of good advice on what to do, but I didn't necessarily take that advice. I was torn between what they said I should do to what I actually wanted to do. Two of my closest friends met each other on the web, and now are happily married, and they are blessed with a most beautiful baby girl to begin their family. They are true friends, and are like family to me. For whatever reason, I seem to be attracted to long distance relationships. After my first marriage which happened to be a high school romance that turned into 20 years of marriage and a family with two sons, I remarried in 1996 to my second wife who happened to be who I considered a beautiful Hispanic woman whom I met in the workplace with a prior company. She was actually one of my customers and I knew her for several years before we became involved with each other. For at least 3 of those years prior to marriage to her in 1996, I can remember driving a 375 mile journey to West Texas almost every weekend to see this woman. That marriage lasted 9 years. But then the world came to a standstill just prior to meeting my present wife Virginia. To preface meeting Virginia for the first time, I was told over and over again by my friends and family that I should find someone who lived close by and try and not get hurt again. I was told that I needed to remember who I was and how old I was, at the time being 52, almost 53. Still, I wanted a vibrant and youthful woman in my life. I wanted to feel young again. Working in the computer industry, I was not keen in trying to do what my friends have done, and that was to meet someone on the internet, because at that time, I truly didn't believe that was the way to meet someone. At my age, I truly didn't think I had the know-how, but my friends convinced me to try it. And I did. I went to a few of the dating sites, but I soon became disappointed because that seemed to go nowhere, until the fateful night I met Virginia. OHHHHHHHHHHHHHHHHHHHHHH MYYYYYYYYYYYYYYYYYYYYYYYYYYYY!!!!!!!! We met on a website called MATE1 which at the time was primarily an Asian site. When I saw her for the first time, my heart just about stopped. Who was she? Was she single? Allot of the women you meet on the web are either married with lots of children, or divorced or widowed with lots of children. The first thing I could think of was that her husband has to be one of the luckiest men in the world. Well guess what?!!?!!!?? I was wrong again. She was not only single, but had NEVER been married. She lived in a Convent. She really never had a man she considered a sweetheart nor did she ever consider the possibilities of becoming a Nun. There was just something about her beauty and innocence and her knowledge that caught my attention. We kept in touch on the Internet for just 3 months and then I had already scheduled my first trip to see her in the Philippines which was a 7000+ mile journey. To meet, I had to get some cash together, first for the ticket for me to the Philippines, and second, a ticket for her to fly from her present hometown of Cagayan de Oro City to Manila, where we were to meet. After my 20+ hour flight which took me from Dallas Texas, through Detroit, to China, Japan and finally the Philippines, we met at the Ninoy Aquino International Airport in Manila. There we both stayed a few days and toured Manila, then both of us flew back together to Cagayan De Oro City approximately 500 miles away. I met her adopted family, all the nuns and priests that raised her for the last 10+ years. My life again now had a meaning, and I vowed to marry her the next time we meet. We were separated for about 1 year before it was time to revisit her to bring her back home with me to the United States. It was fairly expensive to say the least, as I had to hire an immigration attorney and spend a small fortune to get all the paperwork signed, deal with the U.S. Embassy in the Philippines, and then fly back with her in early May of 2007. 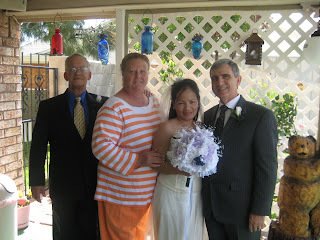 We were married on May 11th, 2007, in Odessa Texas. Two of our dearest friends, Gwen and Charles Lout in the picture below, made our dream come true, as they sponsored us at our marriage, and handled every aspect of the preparation. We were finally married at their beautiful home. Since that time, we both seem to be still on an extended honeymoon, and I'm hoping that it will never stop. I am happy, doing well at my job, doing alot better emotionally and physically, and to this day, I know that marrying that woman was absolutely the most righteous thing I've done in my lifetime. Now, I'm not suggesting that everyone try a long distance relationship over the internet, because there comes a time that you must commit to the other person if you are to go further together, and that type of relationship is only for people who really feel that they are truly in love and must go further. There are lots of pains and heartaches on the home front that you would need to go through, let alone the fact that meeting someone who lives in a timezone that is 13+ hours ahead of your time could be something that both cannot handle. When it is night here, it is the next day there. Be wise. Know what your heart wants, and know what you must do. Make wise choices as making this choice may not necessarily be the best for either person. Remember...COMMIT, COMMIT, COMMIT and then COMMIT!!! !.